Can we please nickname it “The Bathtub?” Or is that too obvious? Either way, Akron is the next ballpark on our Great Ohio Ballpark Tour in May, and this is the only ballpark on this tour that I have visited, and Brett has not. I got the chance to job shadow the Akron broadcasters for Fox 1350 — Jim Clark and Dave Wilson — on Tuesday’s game against the Trenton Thunder. I spent the full game in the booth on headset, and not only did I get to enjoy a great ballgame; I learned a lot about broadcasting from two long-time professionals. So the broadcast booth is pretty nice. But what about the rest of the park? There’s nothing better than a downtown ballpark, and Canal Park does it right. The park is right in downtown Akron, just a short jaunt from Highway-59 and a quick walk away from other Akron attractions like the theatre district. Downtown ballparks also give some of the best views in baseball (in my humble opinion). But I can hear you already: sure, downtown ballparks are great, but parking is always a nightmare! Relax; Akron does it right once again. Just beyond the right field fence is a parking structure that charges a $2 flat rate to park the entire evening. And, if you get to the lot after 6pm, parking is free. How’s that for a deal? Most of the seating in Canal Park is lower-level seating along the foul lines and behind home plate, but there are a few sections worth highlighting. “Duck Row” is a small, two-row section along the third base line that offers stool-table seating. It’s ideal for people like me who have to find coordination to handle their food, their beer, and their scorecard; putting everything on the bar in front of you makes life a heck of a lot easier. Just be sure to keep an eye on the game–foul balls can come into Duck Row pretty hot. Canal Park also offers numerous picnic areas within the confines. Just behind Duck Row is “Fowl Territory”, which includes a number of picnic areas catered towards families. 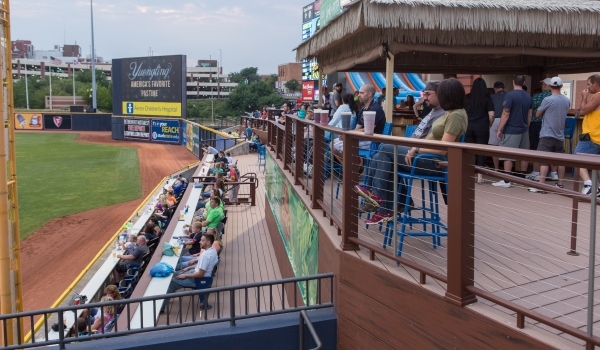 Once the weather warms up and the kids get out of school, Akron opens the “Tiki Terrace” beyond the right field fence as another picnic area, this one geared more towards those looking for alcoholic libations. Canal Park is well-built in that it caters towards families, but ensures every baseball fan a great seat in the ballpark. Buckle up readers: this is where it gets good. You like extreme food? We got extreme food. How about the “Three-Dog Night,” a hot dog…inside a bratwurst…inside a kielbasa…all topped with sauerkraut? 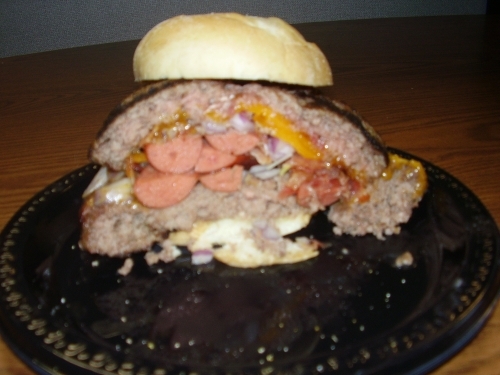 Or, if you’re more of a burger fan, you can have the “Nice 2 Meat You,” a 1.5 pound hunk of burger topped with hot dogs, bacon, cheddar cheese, and onions. This year, Akron is introducing the “Notorious P.I.G.,” a large helping of pulled pork, bacon, and sauerkraut, all stuffed between two pork tenderloins. Then, for dessert, you can have “The Screamer,” an ice cream sundae served in a full-size batting helmet. The monstrosity includes 21 scoops of ice cream and Lord knows how many calories. Made for sharing. Hopefully. 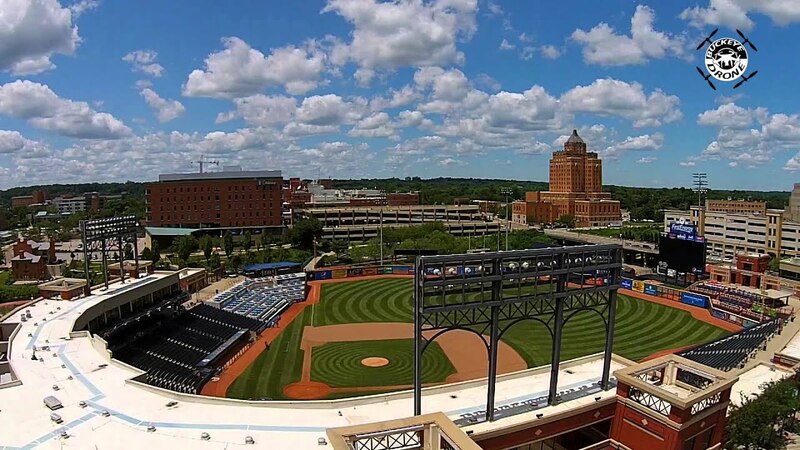 There are few better minor league parks than Canal Park in Akron, which combines an ideal downtown atmosphere with excellent seating options and some of the best ballpark food you’ll find in the country. Definitely in my Top 3 of minor league ballparks.